Although I’ve stressed in prior posts that a chess engine, such as one of the Fritz family of playing programs (e.g. Fritz, Rybka, Junior, Hiarcs, and Shredder) can best be used to point out chronic recurring problems in one’s chess play over the course of many games, you can also use a chess engine to zero in on a particular problem point in one of your recent games. This is why I recommend that you have a chess engine analyze your game as soon as possible after its completion while the game is still fresh in your mind. You’ll remember places in the game in which you perhaps had trouble making a decision when faced with more than one plausible candidate move. And, occasionally, you’ll also get a bit of validation from the process (even though “validation” isn’t quite what the “blundercheck” feature was designed to do). This game lasted for seventy moves. I had Hiarcs13 analyze it afterward, with the “Threshold” value set to “30”, meaning that the engine will not show me a better move it’s better than what I’d actually played by 3/10ths of a pawn or more (approximately equivalent to a tempo). The engine found exactly one improvement for me in this seventy move game; it occurs at move 9 (the highlighted spot in the illustration above). Assuming that Hiarcs’ suggested variation had been followed by both players (a longshot, given the overall level of play in this game), I could have increased my edge by more than a pawn if I’d played Hiarcs’ suggested move. So what does this have to do with the matter at hand (e.g. Fritz or any other chess engine “not showing you your good moves”)? Because I’d set the “Threshold” to such a low value, I can assume that if the other sixty-nine moves I played in this game weren’t the best moves, they were still close enough to being the best that the difference wasn’t worth mentioning, because the engine didn’t show me any improvements. Everything I played in this game (with that single exception) was evaluated as being within 3/10ths of a pawn of the (subjectively, i.e. in Hiarcs’ opinion) best move. 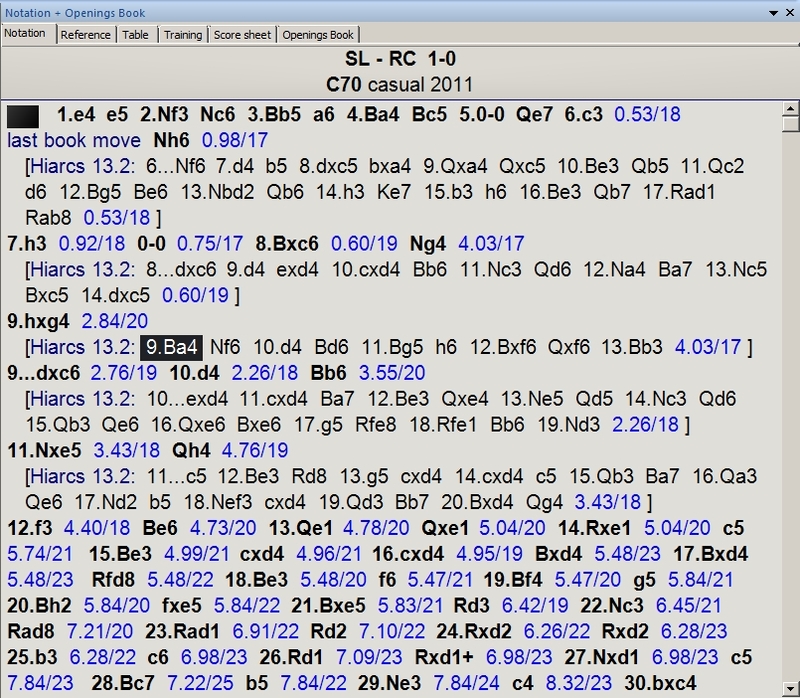 There’s your “validation”, the engine’s confirmation of your good moves, if that’s all you’re looking for when you have a chess engine analyze your game. But in the case of this particular game, I’m not resting on my laurels; I still have work to do. And once again, a chess engine is going to aid me in figuring something out. Black has just played 17…Rfd8, threatening my d4-Bishop. Remember when I mentioned that you should have a chess engine analyze your game as soon as possible after you play it? (And, by the way, I don’t mean “immediately” – but I do mean within the next few days after the game is played.) I remember this point in the game, and I recall thinking about several candidate moves here: 18.Rd1, 18.Be3, 18.Bf2 (but not 18.Bc3 because I wanted to develop the b1-Knight to that square). …because the computer’s evaluation didn’t change after my move (it remained at 5.48 pawns in my favor). But I still wonder how the other candidate moves rate in Hiarcs’ evaluation. …and discover some interesting facets of this position. Hiarcs has searched a bit deeper here than in the above illustration (an extra ply), which is why the positional evaluation is different. My preferred move (18.Be3) is tied for second choice with 18.Bf2, and is evaluated as being only 1/100th of a pawn better than the fourth-place move 18.Bc3. So I can conclude that it realistically didn’t make a lick of difference which of my candidate Bishop moves was played. I also notice here that Hiarcs’ top choice was the surprising sacrificial offer of 18.Nxf7. 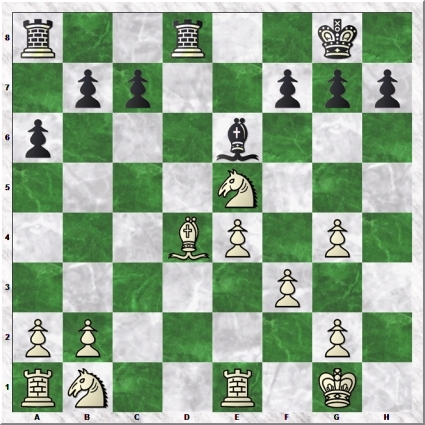 Had Hiarcs’ suggestions been followed by me and my opponent, I would have ended up giving up a Bishop for a pawn but retaining a big positional advantage. But since that kind of play requires a more deft touch than I possess, and was only better than what I’d played by just over 1/10th of a pawn, I can rest easy that I did the right thing when I played 18.Be3. I was also right to reject the Rook move; it’s not even showing on the list of the top six moves in this position. Even though I knew I was in the driver’s seat through most of this game (and Hiarcs13’s analysis confirms it), I still recall that one point at which I wasn’t sure I was doing the right thing. Having a chess engine zoom in on that one particular point (especially when the game is still fresh in my mind) helps me better understand the position in the event I run into a similar one sometime in the future. You should consider following this same technique when you’re reviewing your games and come across a position that caused you even a small shred of trouble at the time the game was played. Every little bit of such knowledge that you can add to your chess arsenal will certainly help you in your future games.